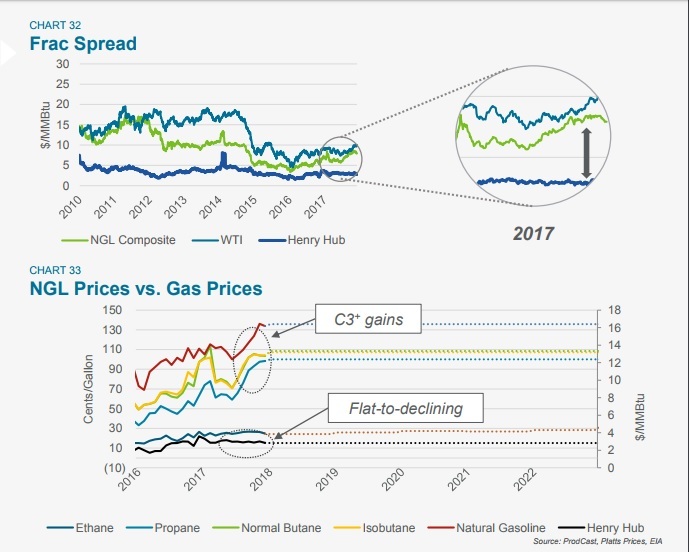 In the latest installment of its FundamentalEdge series, Drillinginfo released Chasing Crude, a market outlook report focused on its latest view of price and production forecasts for the oil, natural gas, and NGL markets. 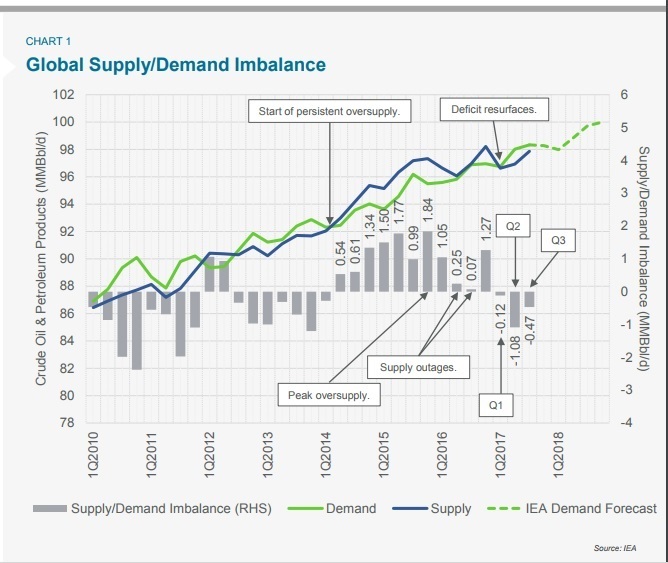 Chasing Crude continues to monitor the global supply/demand balance for crude oil. Following OPEC and non-OPEC producers’ agreement to collectively cut supply by 1.8 MMBbl/d, implemented in 1Q2017, the supply/demand balance has moved into a deficit and began working off the stocks overhang. However, the deficit hasn’t been large enough to work off the overhang in 2017. Drillinginfo now expects normalization of global inventories to occur in the second half of 2018. A secondary focus of Chasing Crude is the US rig count response. 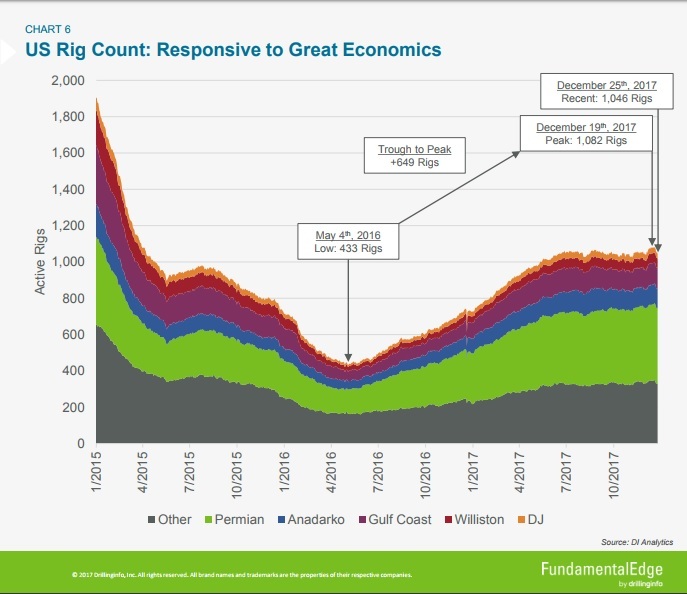 Great economics and improved prices have fueled a significant rise in the active rig count from the low, which bottomed out at 433 rigs on May 4, 2016, before climbing to its recent peak on Dec. 19, 2017 at 1,082 rigs. Of the 649 rigs added back to the fleet in that time frame, ~50 percent went to the Permian and Anadarko basins. Furthermore, Liquefied Natural Gas (LNG) is now the leading sector driving demand growth for natural gas. 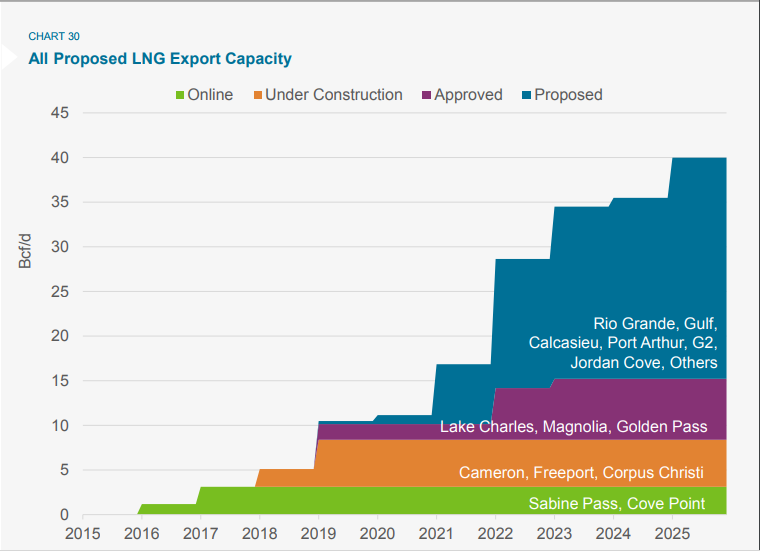 Drillinginfo’s five-year forecast for LNG exports only includes projects currently under construction. This represents only about 22 percent of the total proposed projects. As much as 40 Bcf/d of LNG liquefaction capacity has been proposed to FERC. 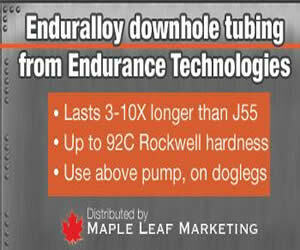 As crude oil prices reached levels north of $55/Bbl, the market refocused its attention on crude over natural gas. Early forecasts of a natural gas price above $3.50 in 2017 have failed to materialize in the face of the mild 2016/2017 winter season. The Permian and Anadarko basins have led rig gains since the low in May 2016 and continue to be the main focus plays for crude-directed drilling. The Appalachian basin (Marcellus/Utica) brought record infrastructure developments to the US, from pipelines to LNG terminals. Natural gas production growth is expected to continue, but price gains will be limited while demand growth catches up. In line with crude oil and natural gas, NGL production is expected to grow in the next five years as demand also increases in the form of ethane and LPG exports. Drillinginfo expects short-term gas prices to remain low due to strong production growth from the Northeast as pipeline infrastructure comes online. This growth will also be supported by the higher crude oil price environment. Longer term, Drillinginfo estimates the price equilibrium at $60/Bbl WTI for crude oil and $2.65/MMBtu for natural gas starting in 2021 and production growth in all commodities at a rate to meet projected demand growth.